Robyn's trip was a communion with the desert, her dog Diggity, and her camels. Each day started with an hour or so of packing 1500 lbs. of gear on her camels, after she had located them. 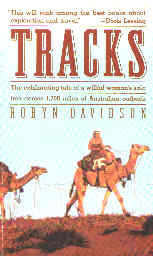 Camels, in order to forage naturally, had to be hobbled at night. This necessitated tracking them down in the morning and returning them to camp. During an early leg of her trek an Aborigine, Eddie, accompanied her for 200 miles. Eddie was "healthy, integrated, whole" and "If," she writes, " 'to be truly civilized, is to embrace disease,' then Eddie and his kind were not civilized."